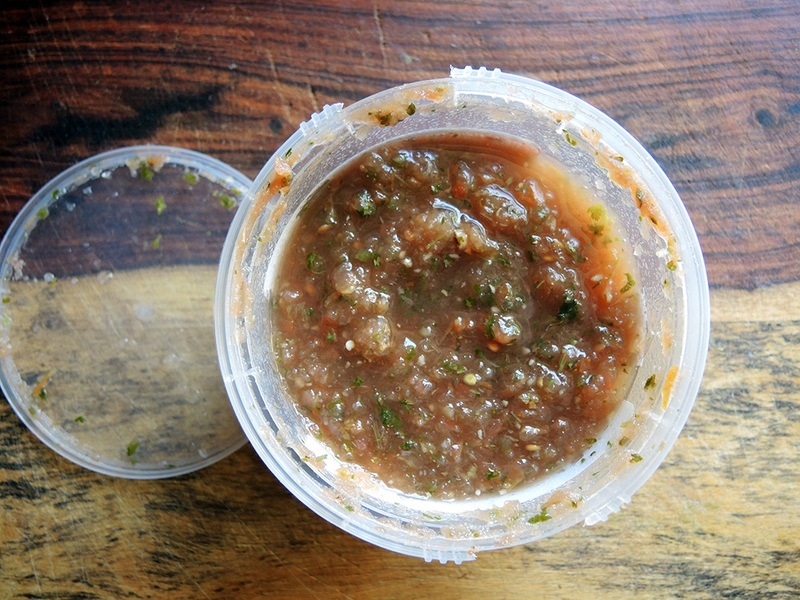 Fresh salsa is hard to beat and practically impossible to find at the grocery store. When a representative for Nola’s Fresh Foods contacted me to try a free sample of their Salsa Fresca, I was more than interested if not a little skeptical. The name threw me for a loop because NOLA usual means New Orleans, LA, but the company is actually based out of the Boston, MA area (Jamaica Plain to be exact). The owner, Sherie Grillon, grew up in New Orleans, so the name pays tribute to that part of her life, but she mastered the recipe for her salsa in Austin, TX before finally settling in Massachusetts to start her business. Nonetheless, I’ve remained hopeful that there had to be something out there in stores that didn’t taste like chunky, spicy tomato sauce and wilted, soggy vegetables. As it turns out NOLA’s Salsa Fresca is the best I’ve found so far. The first thing I noticed is that the salsa comes in a tub. That’s usually a good sign since most allegedly fresh salsas come in tubs rather than sealed jars or cans. The next thing I noticed was that the salsa itself, while blended, had actual vegetables in it. A quick examination of the ingredients showed that only vegetables and spices comprised the list, which is how any good salsa should be made. I was especially impressed that the salsa contained no added sugars or preservatives and that NOLA’s Fresh Foods actually means the word “natural” when they use it on the package. I don’t add colors, preservatives, or sugar to my salsa at home, so why would I want to buy it that way? The blended salsa still had a good texture and the flavor of each vegetable really shined. 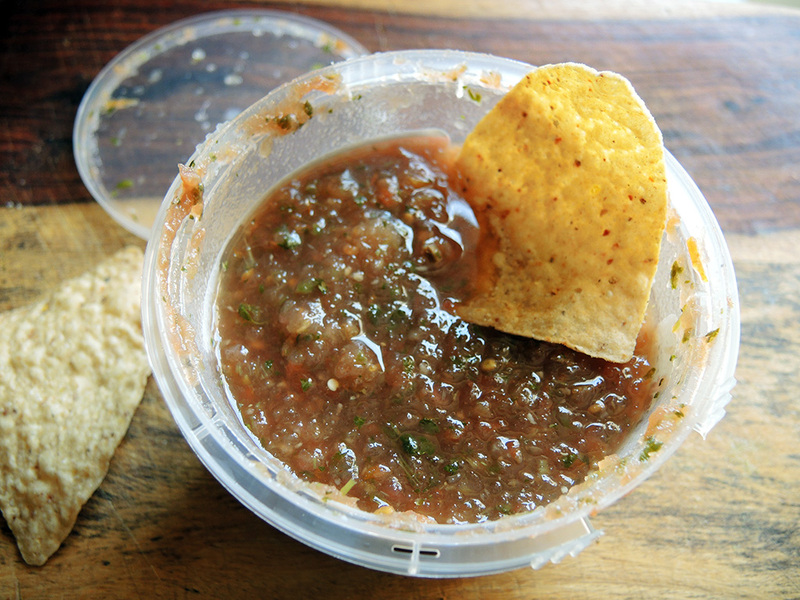 The spicy heat offered by the “medium” Fresca Salsa was just right – not too hot or too mild. If I had one complaint it would be that the salsa is definitely heavy on the garlic. That’s great for the garlic lovers out there, but those who might not like that may find that there’s too much kick. I could definitely see myself not only happily putting this salsa out with chips for guests, but even using it in some of my recipes (like my Lean Beef Chili , Ceviche, or my Citrus Marinated Carne Asada) when I want to save time. As part of the sample, I also received a recipe from NOLA’s Fresh Foods for a Game Day Chili recipe. They recommend actually using the salsa in the chili rather than just as a topping. Check out their recipes for more creative ideas for cooking with the salsa. 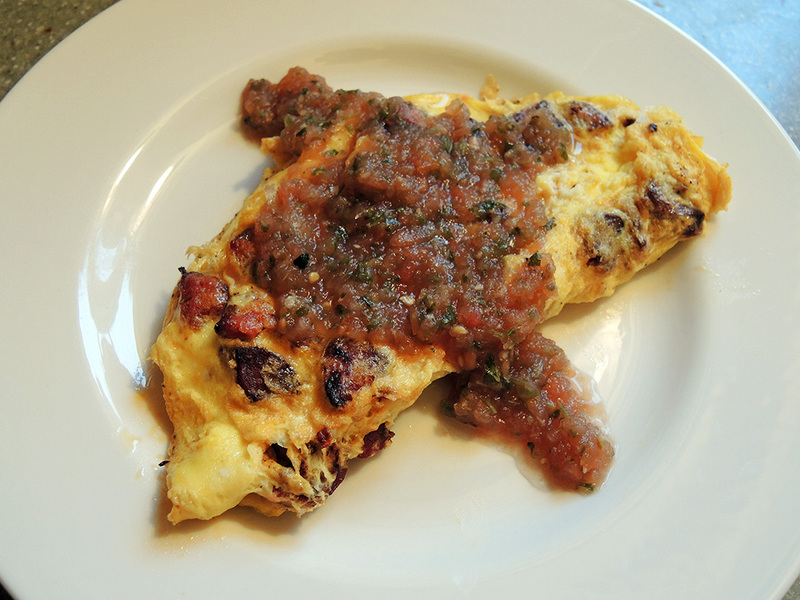 I tried it myself as a topping to a chourico omelette and really enjoyed it. I would recommend giving NOLA’s Salsa Fresca a shot because not only is the product good, but it supports a local small business. 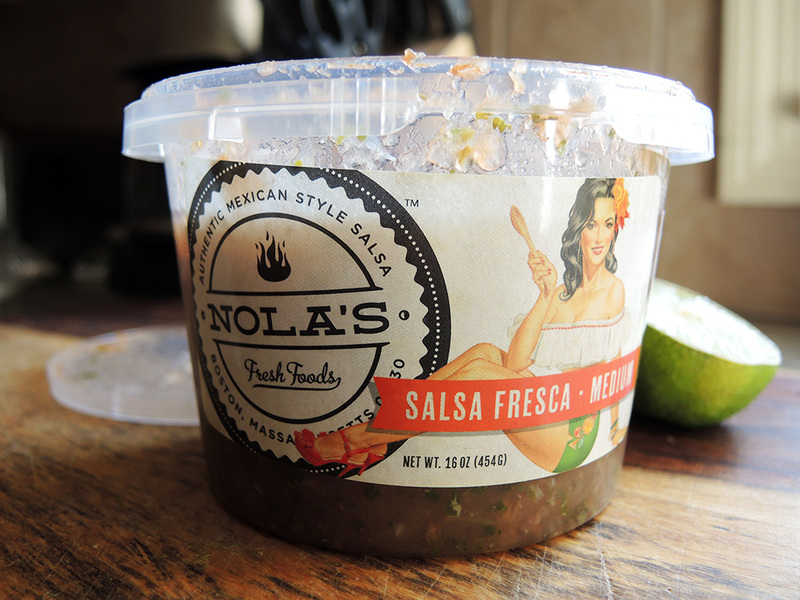 Anyone looking for a quick way to add salsa to a meal without having to make it from scratch should consider NOLA’s Salsa Fresca as a viable option. Disclaimer: I received a free sample of the product for review, but the opinions expressed within this review are my own. I’ve tried Nola’s before. Tastes like what you would get in a Mexican restaurant but way too garlicky. Personally, I prefer Chica de Gallo or Plucked for my local fresh salsa fix. Chica de Gallo’s ghost pepper salsa and guacamole are on point. Not a fan of sweet salsas myself, but my friends like their mango salsa. Plucked, while more tomato-y than I’m used to in the SW, is fresh and chunky. Good for serving to my NE friends. The story behind the name is interesting. I’m originally from Texas and love salsa. I like making my own salsa too but when time is short I do buy one from the refrigerated case. That omelet of yours looks very tasty.